There are several important things you can look for to determine whether or not you have a leak. Among the first are brown or other dark colored stains on the ceiling. While these stains are the most noticeable indicators, you should also be on the lookout for moisture, especially a buildup of it, in addition to dampness coming from the ceiling or along the walls. It is important to realize that the source of a mobile home roof leak may not be located directly next to wet spots. A hole in the roof, ceiling or floor may actually allow rain or other water and debris to travel a fair distance to the final area where moisture will collect. Of course, not all signs of a mobile home roof leak are visible. In fact, you may feel soft spots caused by rotten wood when walking along the floor or when touching a wall. Sometimes you may even notice this before you see any spots on the ceiling above. A musty smell is often a telltale sign as well. When a leak is bad enough that brown stains develop on the ceiling, chances are that ceiling may not last much longer. Should the outside structure of a mobile home deteriorate from the moisture exposed during a leak, there is a great chance those living inside the unit could be in danger. Also, as previously mentioned, many of the issues you will spot that indicate a leak involve a high amount of moisture. When moisture builds up, the home is susceptible to black mold and mildew. Breathing in mold spores contributes to a long list of health concerns that are associated with mold and mildew, such as asthma, nasal congestion, conjunctival inflammation and rhinitis among others. For those who notice indicators including headaches, nausea, or flu-like symptoms, there could be a mold issue. Elderly residents are particularly prone to increased dangers. Not only are their immune systems weaker to the dangers of mold and mildew, but the possibility of sliding, stumbling and ultimately falling because of a puddle that has collected on the floor of the home is a major concern. Finally, there is even a concern when it comes to fires. Wires can be exposed to the elements when the hole of a leak exposes them. Those wires can short and spark and start a fire that would send the entire structure aflame. 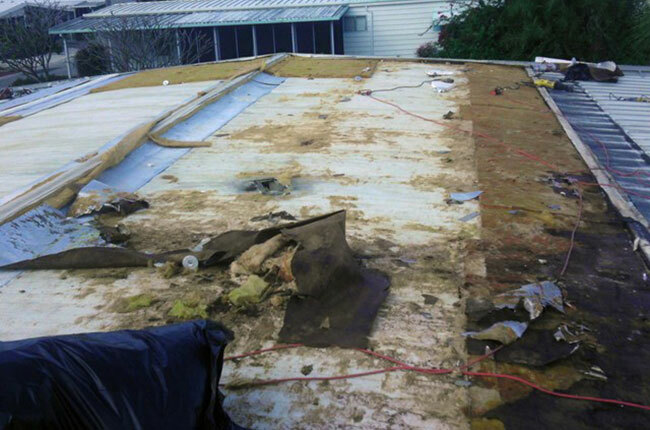 What to Do When Your Mobile Home’s Roof Leaks? Contact us today and we will arrange a time that works best for you and get a representative out to perform a detailed video inspection of your roof so you can easily see where the problem areas might exist. We then give you a free, no obligation estimate, and your beautiful new roof will be installed in days. If you don’t need it, we don’t sell it!